In order to improve tourism infrastructure in the next few year in preparation to receive soccer lovers from all over the world the Brazilian government and the private initiative are going to invest 2.2 billion Brazilian reais (US$ 1.2 billion). The amount is part of an investment package to be made in the country up until 2014, when Brazil is going to host the Soccer World Cup. The information was supplied by the executive secretary at the Ministry of Tourism, Mário Moysés. According to him, several projects are being developed for Brazil to be able to cater to approximately 600,000 tourists who should come to the country to attend the event. After 64 years, the largest competition between football teams on the planet will take place in the country once again. And the eyes of the entire world are going to be turned to Brazil. A survey on the competition’s socio-economic impact on the country, conducted by the Getúlio Vargas Foundation (FGV), forecasts an increase of 20% in the number of tourists that will come to Brazil exclusively for the Cup. By 2014, the country should receive approximately 5.9 million tourists, with a turnover of 10.78 billion Brazilian reais (US$ 5.9 billion). “The ministry is now working on four different areas of tourism: international promotion of the event, investment in labor force training, improvement of public tourist attractions and incentives to the hotel industry,” says Moysés. Among the ministry’s several professional training programs, Moysés highlights ‘Olá, turista’ (Hello, tourist), which will receive investment of 13.92 million reais (US$ 7.7 million). “The program will make cost-free English and Spanish lessons available to approximately 80,000 workers,” explains the secretary. 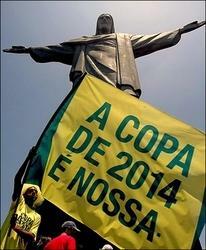 Moysés underscores the fact that these projects already existed even before Brazil was selected to host the Cup. The secretary claims that the investment was only moved to an earlier date, so that all of the requirements of the FIFA may be met. “The most important thing is to remember that even though the investment is linked to the Cup, the legacy of these improvements is going to generate a continuing expansion of the tourist flow in Brazil for years to follow,” says the secretary. The survey conducted by the FGV, published by newspaper O Globo, calculates that by the beginning of the event, the government and private enterprises are going to invest 155.7 billion reais (US$ 85.6 billion). Aside from tourism, the amount is going to be spent on infrastructure work, construction and modernization of stadiums and improvement of public services, among others. Out of the total forecasted investment from now until the start of the Cup, 64.1 billion reais (US$ 35.3 billion) should go straight to the workers involved, taking into consideration that the scheduled works should generate 3.6 million jobs per year until 2014. The services sector alone should receive investment of 32.5 billion reais (US$ 17.9 billion) and generate 1.2 million jobs per year, or 7.2 million up until the year of the competition.